Shih, Bryan and Williams, Yohuru. The Black Panthers : portraits from an unfinished revolution. NY: Nation Books, 2016. 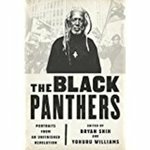 Shih, Bryan and Williams, Yohuru, "The Black Panthers : portraits from an unfinished revolution" (2016). History Faculty Book Gallery. 56.